What’s that Nip in the Air? Fall doesn’t officially start for another week or so. How does the weather just know? I know, I know. Its nature, and there’s a cycle to the seasons. But as soon as Labor Day weekend is over, there is a noticeable nip in the air that says “summer’s coming to an end”. The arrival of apples at the farm stands and farmers market says it too. We picked up a bag of Red Gravenstein apples. These are tart and sweet, good for cooking and eating. It’s one of the old-fashioned apples that you don’t see much anymore. Gravensteins are a particular variety that my father remembers from his own childhood, not from some bucolic farm experience, but something his produce seller father (my grandfather) used to bring home in late summer. My dad’s memories of these apples are strong, and he has (mostly unsuccessfully) sought them out. I’ve been slightly more successful. This year, I saw an ad in the local Maine paper, we so stopped by Sweetser’s Apple Barrel and bought a bag. Closer to home, as of last week, the caramel apples at Wilson Farm are in. These are my fall indulgence. Who can resist a juicy, crisp apple enrobed in caramel and then rolled in chopped peanuts? I know I can’t. I limit myself to one a week, and I savor it by cutting it into quarters and eating it over several days. So, so good! As the end of summer rapidly approaches, we are making the most of the corn and tomatoes, and the grill. We are a “charcoal” house, so once the weather gets cold, outdoor cooking ends until spring. It’s just too hard to keep the fire going when you’re fighting with the weather. We talk about getting a gas grill to use in the winter, but never seem to justify it. There is still another month or so to grill outside, but the days are numbered. Howard grilled a top round steak from Chestnut Farm. It was a little chewy, not the most tender cut of meat, but tasty. It was a big steak, too big for one meal. 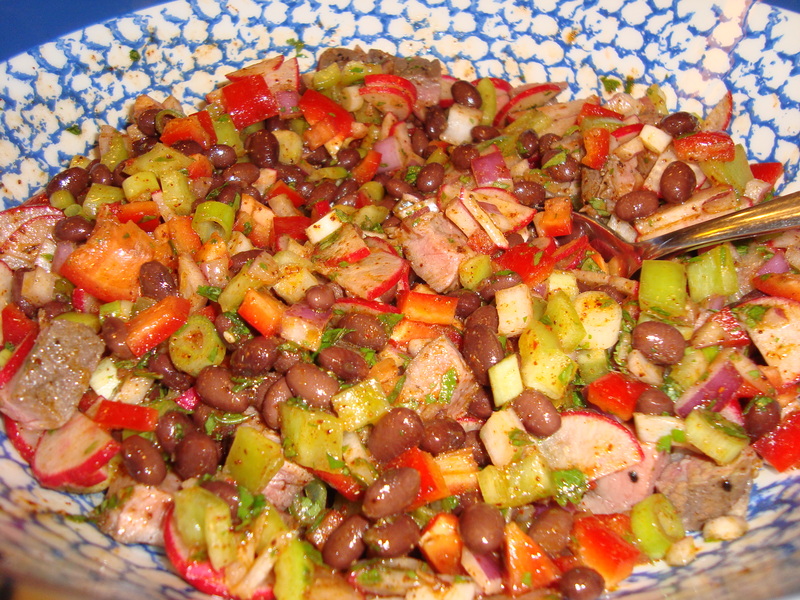 With the leftovers, I made this Latin-flavored salad that we always enjoy. Place steak, onions, scallions, peppers, radishes, black beans, and cilantro in a large bowl. In a jar, make the dressing by combining olive oil, lime juice, garlic, cumin, chili powder, and Tabasco. Shake it until combined well. Pour the dressing over the ingredients in the bowl and toss to combine. Season with salt and pepper to taste. Posted on 14 September 2011, in Autumn, Farmers Market, Meat CSA and tagged apples, autumn, steak. Bookmark the permalink. 7 Comments. 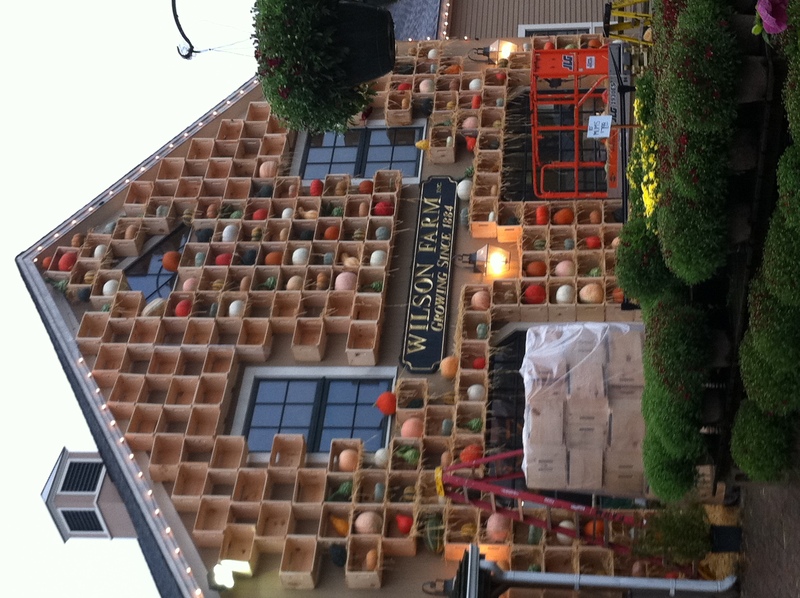 hmmm….looks like it’s been too long since I’ve been to Wilson Farms! I heard it will get into the 30s later this week (at night…for now). In the 30s? Really? I hadn’t heard that. I guess summer is almost over. You need to get yourself over to Wilson Farms and treat yourself to a caramel apple, Sara! That looks like a wonderful meal. I love the last few weeks of summer produce – I feel so anxious to enjoy as much as possible, but I also try to slow down and enjoy it while it lasts. I woke up to a very foggy morning here this morning and fall is definitely starting to make it’s appearance. Fall and spring are my favorite seasons. I am so glad that you were able to find Gravensteins. We get them here and reading about the apples that you have there made me realize that it is almost time to make a trip to Apple Hill. That is just the coolest photo of the pumpkin and gourd wall! I’m back. :) I got interrupted earlier because we had to go to the store before it closed…I just wanted to say that your salad looks delicious. It looks so colorful and the flavor combinations sound so good. I have Gravenstein apples in my orchard. They are one of the first varieties to fully ripen. I always suggest them to anyone who loves to make apple butter…they are the perfect apple for that recipe.